"Forgive our transgressions as we forgive those who transgress against us." “Good sense makes a man restrain his anger, and it is his glory to overlook a transgression or an offense.” – Proverbs 19:11. As I look back on my life, taking offense has always been a tough one for me. The more I care about something/someone, the easier it is for me to take offense. As a friend was discussing with me recently, we have a choice to take offense. As I heard her speak, all sorts of objections started playing out in my head. But, what about this situation? And this situation? And this one!!! 2) I get angry/sad. I think of myself as a victim and the other person as totally insensitive. I want justice! 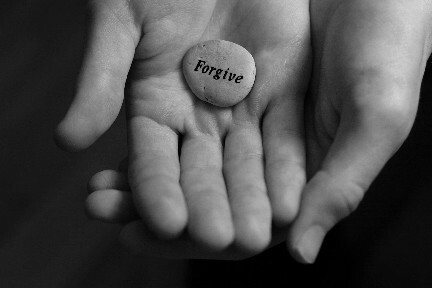 1) I focus on forgiveness: I think of all the times I have hurt other people–purposefully, and accidentally. I thank God for His forgiveness and I extend that forgiveness to others (note: at the end of the Lord’s prayer, Jesus says if we do not forgive others, God will not forgive us). 2) I ask God to show me the person’s heart to understand more why the person said what he/she said. I pray for them in that regard (in true sincerity and love). 3) I trust God with HIS justice and do not demand it. Note, Stephen was stoned to death at the hand of Saul (later became Paul). I firmly believe it was Stephen’s pure heart’s prayer for Saul (as Stephen was dying), that God graciously honored, that made Paul who he was. Jesus also prayed the same thing for all of us when he died on the cross…”Forgive them Father, for they know not what they do.” That pure prayer led us to be saved from our sin and to have access to the Father and eternal life. DID YOU CATCH THAT??? A pure heart’s prayer for those that offend you will do AMAZING THINGS. Either God’s wrath will come upon the person if they are truly wicked, OR His loving care and the Spirit’s conviction will turn their hearts to repentance (sometimes quickly, sometimes not) and you get to see wonderful things come about in them! Isn’t this our true heart’s desire? To see them change and not be punished? I must set my heart right each time I am offended. In the case of an unintentional offense: I should give grace in the form of assuming the best of the person: They might have had a bad day; The words came out wrong; This person loves me and would not want to hurt me like that; etc. In the case of a purposeful offense: This is where grace comes much harder for me. This is where Christ is the ultimate example of what to do. He was purposefully hurt so many times. He can share in the understanding of my pain. He was PERFECT and was persecuted and wrongly accused over and over and ultimately killed out of pure jealousy and hatred. SO, I have a Saviour who can relate. He can comfort. He can understand. This is where I extend love and forgiveness because of the love that God has poured out on me. And my TRUST and HOPE is in Him to deliver me from the offenses/persecution and to see a CHANGE in the person/situation (or a glimmer of God’s glorious plan for His Kingdom). Lately, God has shown me that the more offense there is, the more grace can be given. And the MORE GRACE, the greater a possibility of change. Some of the worst decisions I have ever made have shown me God’s unbelievable grace to me. The more grace I have experienced from the Lord, the more I want to change and please Him and never go back! I know God doesn’t want me to intentionally expose myself to hurt. He wants me to “guard my heart, for it is the wellspring of life.” He doesn’t want me to expose myself to situations where I will be hurt or tempted to sin against Him. But, if I end up in situations where I am intentionally or unintentionally hurt, He wants me to respond with GRACE. The last question I had for the Lord was whether or not I should take anything from the offense. Does it say anything about me? Should I ignore it if it is hurtful and wasn’t intended for my good? The Lord showed me that HE would clarify that for me. I just pray in earnest, “Lord, if there is anything I need to change in the aftermath of going through this hurtful experience, SHOW me and help me learn.” The Lord is gentle. He is patient. He is loving. He is faithful to move me closer to Him. I don’t need to depend on other people’s opinions of me to determine if I need to change. The Lord will show me. I don’t need to be overconfident in myself either. The Lord can use things the Enemy has created to hurt me for my good. I am so thankful God can bring GOOD out of anything. GOD IS GOOD. HE CAN DO NO EVIL. I should focus on doing HIS will, but when bad things happen, I can trust that He will use it, as a loving Father, for my good and HIS glorious Plan. Amen! Finally, the more I suffer for Christ (and not my own sin…)…the greater my reward in heaven (Matthew 5:12). When I suffer, I ask myself, is this because I did something wrong, or is this because of Christ in me? If it is sin, I ask God to help me turn from my ways (repent) and I reconcile with the person (if possible), and if it isn’t sin, I rejoice in my sufferings for Christ (Colossians 1:24, James 1:2). He is worthy. And may I suffer with grace and dignity for HIM. And if we have not love, what good is our faith at all (summarized words of Paul! )?